Lia Cook’s creative process combines photographic media and computer-aided technologies with a mastery of hand and powered Jacquard looms. Her black-and-white work is based on scanned photographs, which are manipulated on a computer. Digital technology enables her to play with scale, detail, and focus. The visual information is translated with a CAD program into weaving instructions for a digital Jacquard head on a hand loom in her studio. Face Maps: Halfseen could be considered a sketch for the larger work, Binary Traces: Kay (2007-33-1). A black warp and white weft interact to create a loosely woven interpretation of the photograph. The interaction between the binary coding and the physicality of the weaving leaves a distinctive surface pattern or trace. 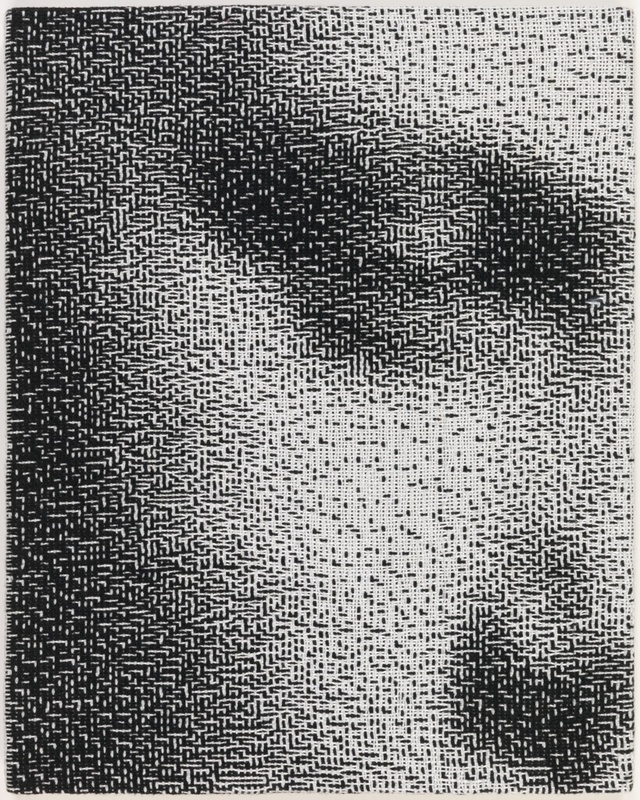 Face Maps: Halfseen, Binary Traces: Kay, and a third Cook piece, Digit Maps: Four Centimeters, were acquired as a group in 2007, due to their complex interplay of detail, pattern, and process.